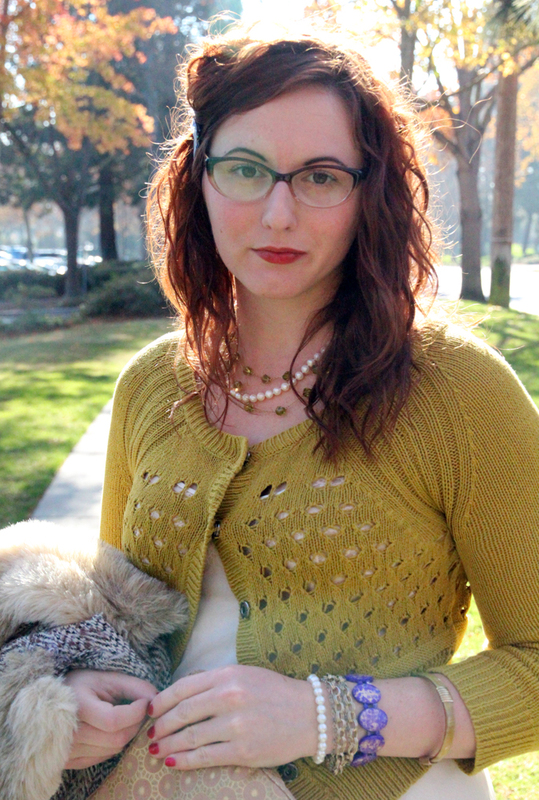 Cardigan, Skirt, and Tights: Anthropologie. Lingerie worn as Dress: Vintage. Bag: Stephanie Johnson (c/o). Boots: Frye. Coat: Anthropologie. Glasses: Martin&Martin. Bracelets: Vintage, Kora (c/o). Watch: Skagen (similar style). Necklaces: Vintage, Banana Republic. I’m not sure how it came up, but Meghan (of Voilà!) and I were talking about our love of a good vintage find and how we both have some timeless vintage lingerie that we occasionally incorporate into our daytime ensembles. We thought it would be fun to have a pajama party one day, so we each pulled out our vintage boudoir best and came up with a lingerie for day look. Check out Meghan’s look on her blog!